Directions: Take I-10 and take Vado Exit. Follow NM 227 west for 3 miles, after Vado Elementary School, turn left on Holguin. The road curves right and crosses the railroad. After passing an intersection, it becomes NM 189. Take a left on NM 28 South. About two miles later turn right to Afton Road or Dona Ana County Road (CR) B008 west. Go about 11 miles, passing the El Paso Natural Gas Afton Station. The road will turn into a dirt road. There will be a farm on the right, turn left here to Dona Ana CR B004 south for 6 and half miles. At the railroad crossing, turn left and follow the road to cross the railroad track. Turn east (left) on CR A017 and follow it for 7 miles. Turn right to CR A011 and proceed 8 miles to Kilbourne Hole. Kilbourne Hole should appear on the right like a giant sand dune. A013 circles around the foot of Kilbourne’s Hole. 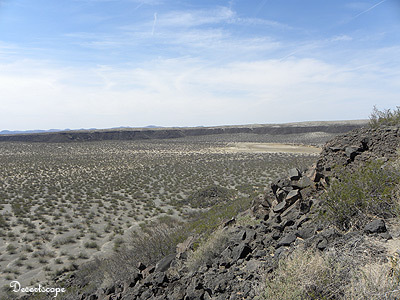 About 100,000 years ago, the land where Kilbourne Hole stands erupted, sending millions of pieces of rock into the sky and a giant crater was formed. The whole crater is about 2 miles long and several hundred feet deep. The geographic aspects of the crater are an intriguing subject for both the geologist and the rock hound. 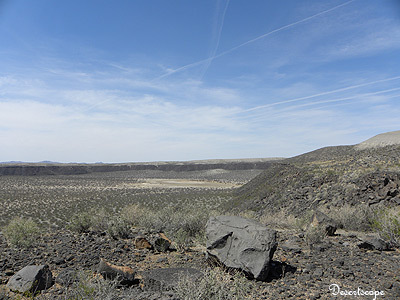 Hiding in the heart of the southern New Mexico's Chihuahuan Desert, Kilbourne Hole can be very hard to find. There are several versions of the directions can be found on the internet, but most offer very vague descriptions. Since most of the roads leading to Kilbourne Hole are dirt roads, they can be passed without being seen. The first time my group went there, we ended up at Hunts Hole instead. Stories abound of people driving around all day without ever finding anything. The best directions I've found are the ones from the Bureau of Land Management. The BLM even has a decent map that shows all the way points. The crater wall consists mostly of black volcanic rocks. 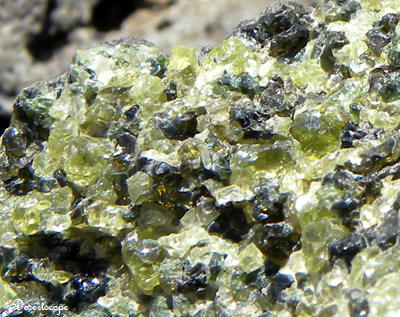 In many areas, the volcanic explosion pushed out olivine glass granules in various sizes. Most of them are within the volcanic bombs, but some have been broken, exposing the green and yellow colored olivine to the environment. Just by walking along the rim of the volcano, one can expect to find a whole lot of these granules. It is like a rock hound’s heaven. Recommendation: please take a lot of water. The desert can be very hard during the day. I always end up leaving early because of the heat.